THE SHOP PICTURED IN 1937 - Note the cutlery displayed in the door and the 'SIGHT TESTED' sign ! 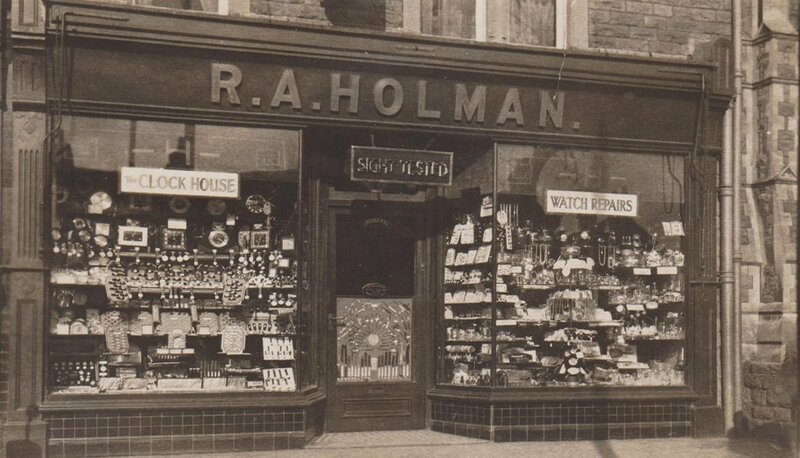 Having completed a full apprenticeship, Reginald Holman, previously a skilled toolmaker, set up in business from home in Argyle Road, Fishponds in 1918 repairing racing pigeon clocks, clocks and watches, and as business grew he moved to the present site on Fishponds Road, previously part of a row of cottages, and set up the shop - R.A.HOLMAN watchmakers and jewellers in 1927. Assisted by wife Mary, and daughter Joyce he took on prospective son-in-law Lere Boyd in the early 1940’s as an apprentice watchmaker and the business continued to flourish whilst also servicing watches for the government during the war years. Grandson and present owner Miles Boyd joined the business from school in 1966, having served an apprenticeship in a leading county jewellers. Miles’s first step was to set Holmans up as ‘Fishponds Secondhand Jewellery and Gold Buying Centre’ and later trained as a Registered Valuer with the National Association of Goldsmiths in 1988 until 2008 when the additional time involved with developing the busy gold and secondhand jewellery business prevented him from continuing the role. Holmans continue to flourish today, moving towards their century, and changing with the times while maintaining their reputation as a respected pillar of the Fishponds retail community. Whether you're selling your jewellery, lost a diamond from your ring, or broken the glass on your watch, contact us and we will be pleased to answer your questions or offer some qualified advice.